As NJ's nor'easter continues, who will boom and who will bust? As NJ’s Nor’easter Continues, Who Will Boom and Who Will Bust? 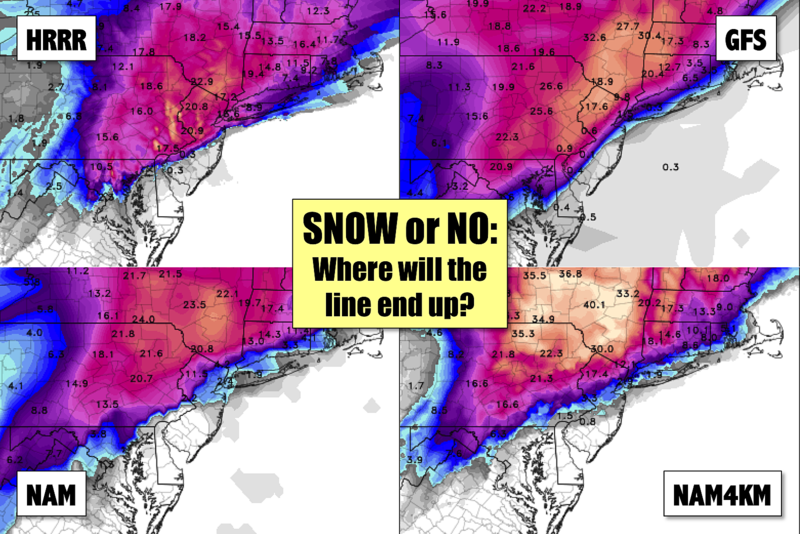 We have been predicting a sharp cutoff between 'a lot of snow' and 'not much snow' over NJ, but exactly where that line ends up is still anyone's guess. Why is it raining in South Jersey? I started talking about this eventuality Monday morning, as models began shifting the storm's track closer to the Atlantic coast. That shifted our forecast scenario from the "Classic Nor'easter" track to a "Coast Hugger" solution. This course has the effect of pulling warmer air over coastal New Jersey, both at the surface and aloft (about a mile up in the atmosphere). When temperatures bump even a few degrees above the freezing mark, snow-lovers become very disappointed. I maintain that there will be a sharp gradient between "big snow" and "little snow" somewhere over New Jersey. Frankly, it looks like that line will be even further north/west than forecast. The bottom line... No matter what falls from the sky and how much, it's going to be a nasty day with poor driving conditions, thanks to the combination of rain, snow, sleet, wind, and coastal flooding. Still expecting impressively heavy snow in North Jersey? North of Interstate 195, it's been snowing at a good clip so far. As precipitation intensity climaxes through Tuesday morning, snowfall rates are expected to peak at or above 3 inches per hour. Snow will pour from the sky at times. And it will pile up quickly. I still like an area of 18-24 inches across a healthy swath of northern New Jersey. Amounts generally over a foot remain likely north of I-195, in the Blizzard Warning area. You know, a few days ago, I was severely chastised on social media for suggesting snow totals of both 0 and 20 inches could occur over New Jersey. Huh, such an outcome sure looks quite probable now. Sustained winds of 20 to 30 mph will accompany gusts to 50 mph inland and 60 mph along the coast. As of this writing, the highest gust so far has been 44 mph at Seaside Heights, according to the NJ Weather Network. Such fierce winds are more than enough to down snow-laden trees and cause scattered power outages. Additionally, wind-driven blowing snow will reduce visibility significantly, perhaps to near-zero during the height of the storm. I think there's a good chance we'll reach this criteria somewhere in the Blizzard Warning area of northern New Jersey on Tuesday. Even if we don't, travel conditions will be very difficult (if not impossible). That's why I am comfortable calling this "The Blizzard of 2017". How bad will the coastal flooding be? Storm surge estimates have increased slightly since last I blogged. I admittedly have some additional concern regarding the coastal flooding threat, as I saw photos on Saturday of a near-blowout low tide along the lagoons of Manahawkin. That makes me worry that the "extra-low low" will be followed by an "extra-high high". Still, we'll hold steady on the surge forecast falls in the 2 to 3 foot range. The highest water rise is expected around Sandy Hook (i.e. the coastline with a northeast exposure). That surge level, combined with a higher-than-usual astronomical tide, is enough to cause "moderate" flooding. Some inundation of roadways and low-lying areas adjacent to tidal waterways will be possible. High tide is expected to occur at 9:51 a.m. at Sandy Hook, 9:29 a.m. at Atlantic City, and 10:39 a.m. at Cape May. High tide along back bays and tributaries can occur up to 3 hours later than along the oceanfront. Precipitation will taper from south to north, between about Noon and 4 p.m. Tuesday afternoon. Lingering snow showers stay in the forecast through Tuesday evening and part of Wednesday too. Winds will die down Tuesday evening, but it will remain breezy overnight. Now that we're in the thick of the storm, my job is just about done. (Which is good news, because I am beyond exhausted.) Our news and traffic teams have the hard job now, tracking accidents, road closures, transit status, power outages, and more. We'll continue to bring you the latest info both on-air and online until the final flakes fall! Source: As NJ’s Nor’easter Continues, Who Will Boom and Who Will Bust?